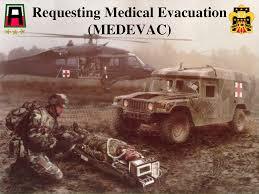 This lecture focus to present Requesting Medical Evacuation. A Medical Evacuation is transmitted above the radio, on a devoted frequency, requesting that medical evacuation take place to take away your injured person from the battlefield. The format request will transmit either a wheeled or an air ambulance depending upon the location, distance, and mission make up. Here also briefly discuss how to prepare a Medical Evacuation request via FM radio and discuss usage of Brevity codes. Finally analysis issues surrounding Medevacs in Training versus Theater operations.